The Calendar supports three selection modes: Single, Multiple and Extended, the default selection mode is Single. In Single Selection mode only one date can be selected. Note that the SelectedDate can be null as well, which means that no date is selected. Keyboard movement selects an item. Multiple Selection mode allows unlimited number of dates to be selected. 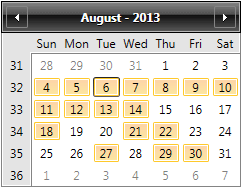 Dragging with the mouse will toggle the selection of the dates. Keyboard movement will move the focus of the item. Selection can be toggled with the space bar key. Extended Selection mode is best suited for selection date ranges. It supports Ctrl and Shift selection.